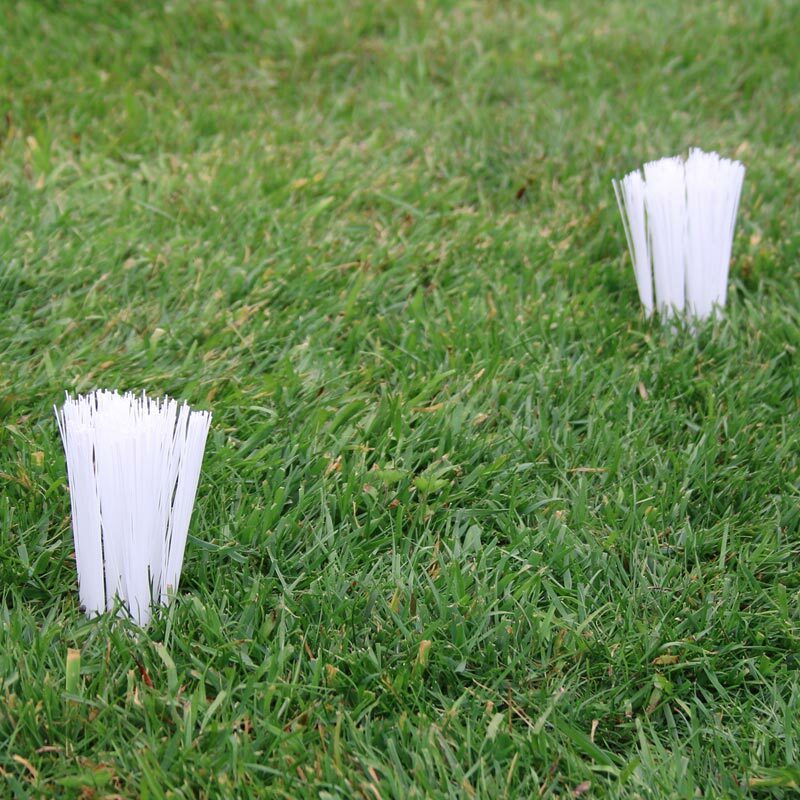 PliFix ® Grass Marking Tufts White are synthetic plastic marking strands of grass implants for marking out pitches, better known as sports ground carrots or layout system for all outdoor grass sports, even used on the pitches at the 2019 Rugby World Cup in Japan. 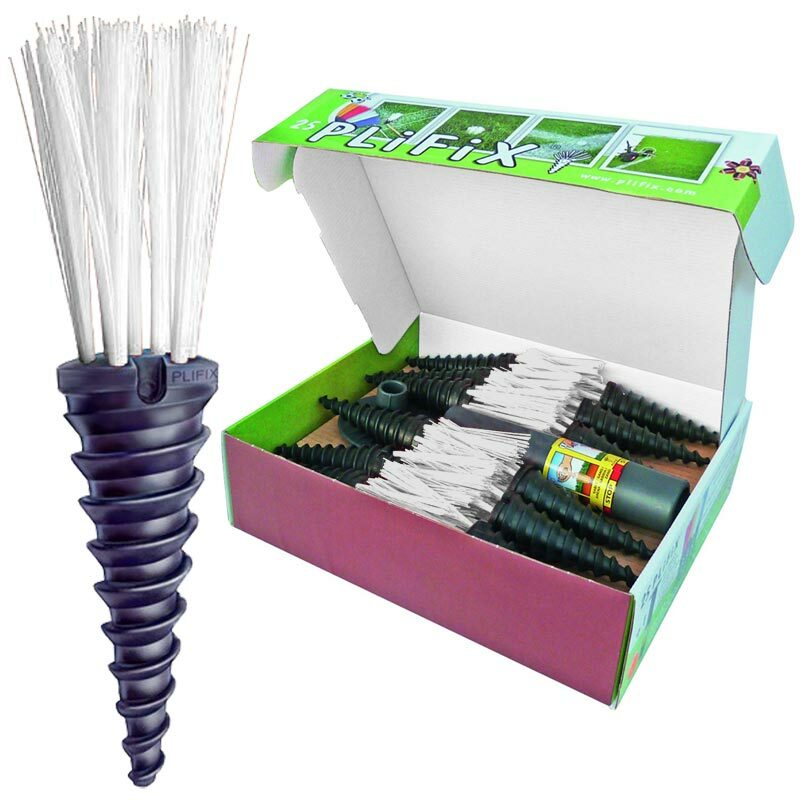 Plastic marking strands UV-resistant synthetic fibre carrot set on a tough polypropylene screw-in base. 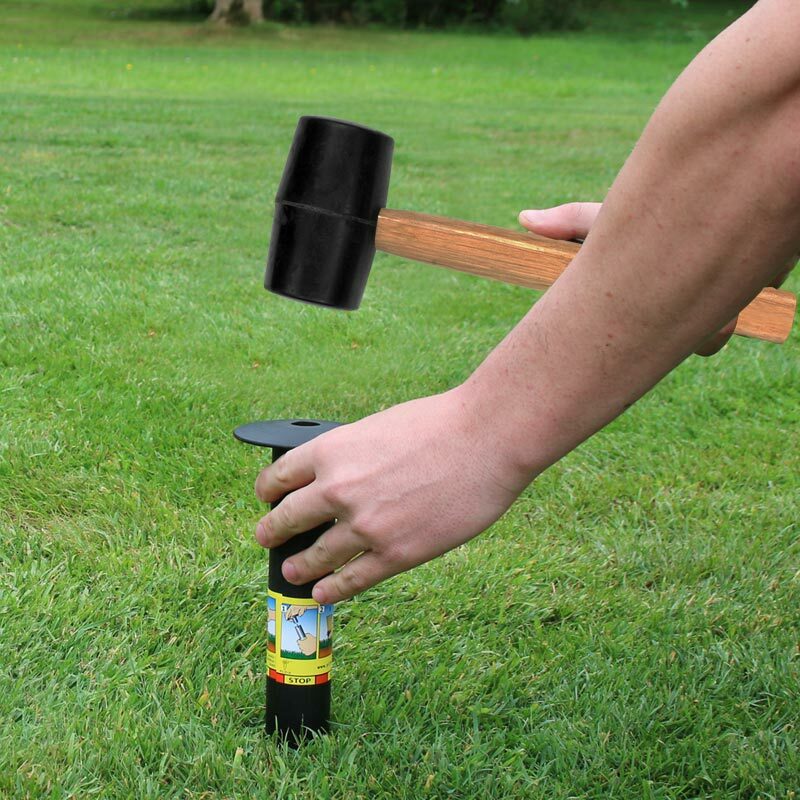 A new instantaneous ground marking system, mark out your ground for sport or marking the location of water pipes, electricity cables and sprinkling systems. Plifix® is easy to fit, completely safe to use, lasts for years and will not damage mowing or other equipment. Once screwed into place the grass tufts remain in situ during mowing, fertilizing and any other ground care that is required. Dressage arena measurements, Football pitch measurements, Hockey pitch measurements and so on you will never need to do the measurements again. Always there when the season starts. No more wasted time re-measuring, simply join up the dots. Easy to install and safe for players and machines. Size: 7.5cm in length and 4cm wide. Place the driving tool over the screw (fibres inside the tube). Hit the driving tool with a malet until the "STOP" mark reaches ground level, then remove the driving tool. IMPORTANT: to not be pulled out, the top of the screw must be set 3cm under ground level. Use sand to fill the gap between the fibres. Our Football club has used this product several times before ,they have been of good quality and have made it a lot quicker for teams when marking out the pitches. Very easy to install, will save me hours of measuring in the close season. This product worked really well for the solution we had to save time re-marking pitches after summer. We have a ground share agreement and these grass tufts will save us hours each season. They went into the ground really easily with the provided tool. 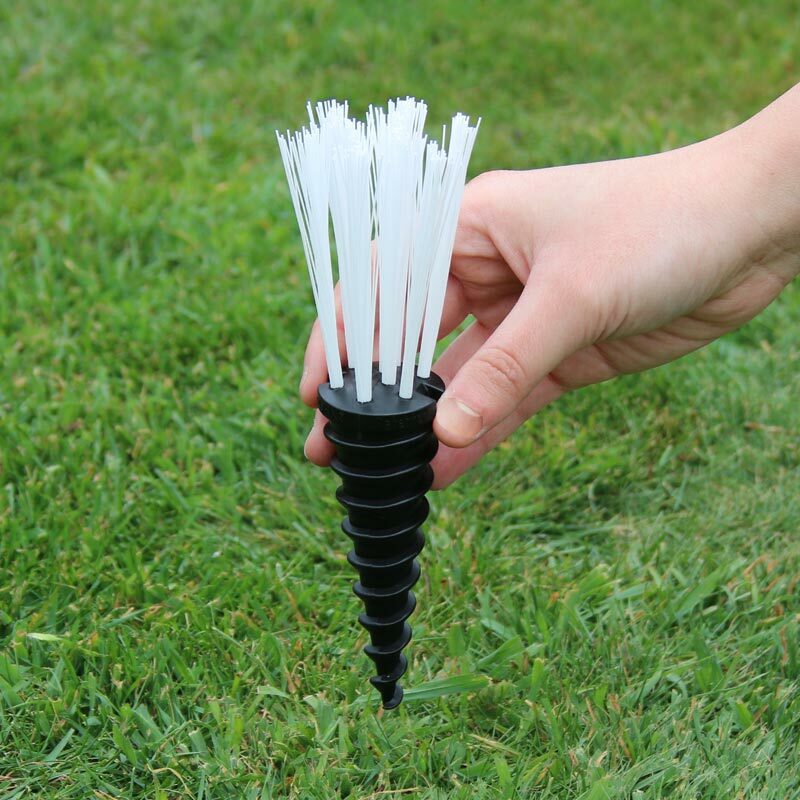 Use these on all our pitches, great product, saves hours of re-measuring when the lines have disappeared. Mark a wholes pitch from scratch in 45mins. It's no fun marking a pitch when rain and the mower have swept your lines away. Hours on all fours with a magnifying glass searching like Sherlock Holmes for a tiny fleck of paint... then a deep sigh as you resign yourself to two hours measuring it all again. With Plifix carrots, all sorted. Even marking from scratch is easy: everything is exactly where you left it. They are tough and somehow survive mowing. An excellent investment. Lost the markings on the cricket square, because of the blasted rain! Had to add some permanent, non-hazardous indicators and these were perfect, once we had done all the measuring!! Highly recommended. Keeping sight of key pitch markings over the summer months on 3 full size rugby pitches is a major task but thanks to these clever tufts we can now ignore this summer weekly task and just pick the lines up again shortly before the new season, saving dozens of man hours over the summer. This time saved could be used to do other maintenance works by our volunteer workforce. great idea, even if a bit expemsive. If you have a fixed pitch and are constantly needing to mark the pitch before you lose the lines and start over again with measuring, these little devils to exactly what they are intended to do - keep all the dimensions intact. They take about half an hour to put in and they dont spoil the game. Well worth it for hassled coaches ! These carrots are a fantastic innovation for us as a Cricket Club. We have permanently marked out our 10 wicket square with carrots imbedded for each track and the two popping creases and will now never "lose" the square over winter or have to spend hours measuring out and marking the square afresh as there is now a permanent, safe and highly visible marker for a good few years to come. The mower successfully cuts over the carrots and there is no damage to them from the scarifier, aerator or our 0.5 - 2.5 ton rollers. Reasonably priced and we highly recommended them to all cricket clubs. Zain Sharif, Kempsey Cricket Club.